Nuby Feeding Bottle - 210 ml | Orange | Anti-colic bottles to prevent baby from gas and colic. 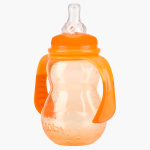 Let your newborn baby have milk in this hygienic bottle. This is an anti-colic bottle which help prevents baby from gas and colic. It has variable flow and it is specially designed with a non-grip system.